Wangsu commits itself in providing specialized solutions to different industries. Wangsu draws on years of experience based on service in various industries to customize solutions for e-commerce, finance, education and other sectors in relation to their individual characteristics. With many years of experience in steaming technology, Wangsu accumulated vast insight of the quiz business and focusing on the two key areas of ”real-time streaming + interactive quiz”, the following solutions have been developed to address common issues encountered in interactive quizs. Mobile accelerator speeds up and optimizes the user’s mobile port, and the multi-device adaptive function shortens page loading time for commodity display, comment, customer service inquiry, etc. Improve user experience at the mobile end, as well as enhance service quality and user stickiness. With the development of online banking, mobile payment, credit card store, mobile securities, P2P online loans and other emerging financial applications, the high availability and high security of the network has become the basic guarantee requirement. Based on its vast amount of resources and rich operational experience, Wangsu financial industry solutions in security protection, business cloudiness, network acceleration, backward traffic, mobile access and many other aspects empowers Internet + Finance; Enhancing brand service value. Upload accelerator: Efficient uploading of massive and multi-format courseware to ensure timely sharing. Whole site accelerator: Dynamic and static Intelligent separation to speed up whole site access. Cloud processing: Real-time, efficient and rapid processing of courseware resources on the cloud. Provide T-level DDos protection and application protection to ensure security. Wangsu’s hosted cloud service adopts customized configuration solutions to address the hosting needs of video source sites, raise customer resource utilization, as well as reduce customer procurement, management and operating costs. In the current complex domestic network environment, online education will often face system expansion difficulties, problematic video playback, slow upload of resources, lack of storage space, content processing pressure, system attacks, multi-device teaching and other issues. Traditional solutions are incompetent in meeting the diverse needs of online education. Providing integrated end-to-end service from the aspects of system construction, content upload, content storage, content processing and delivery, multi-device delivery and security protection, can effectively improve the user experience, enhance user stickiness and reduce customer operation and maintenance costs. Making online education easier. For the media industry, content is fundamental to survival, technology is the pillar of development, the understanding and use of technology has become another major core competitiveness of the media; Good user experience lies in the fast loading of content, the smooth playback of video and the adaptability of multi-device access, etc. After studying the development trend of the media in this new era, Wangsu media industry solutions will help media brands to enhance their user experience, thus enhance media influence. Quality gaming user experience is embodied in fast content loading and version updates, stable operation, smooth video, multi-device access adaptation, burst access and resistance of network attacks, etc. This comprehensive solution is supported by Wangsu’s rich portfolio, redundant resources and abundant service experience, which can improve the user experience of gaming with ease, swiftness and efficiency, and ensure the stable operation and security of games. Wangsu’s powerful R&D capabilities can also provide customized service for the special needs of gaming applications. Fast network access and reliable network security are the basic needs of government websites, and good user experience is closely related to the image of a government. Based on a stable, safe and efficient cloud platform, the e-government solution is supported by professional technical expertise, rich service experience and comprehensive after-sales service systems to provide services for e-government. Rapidly improve the quality of access to the government website, effectively protect the information security of the website, and provide strong technical support for the development of information technology for governments. Mobile live streaming has become the most popular Internet phenomenon, all kinds of Internet celebrities and opinion leaders have appeared on live streaming platforms, attracting increasingly large follower bases and participation, meanwhile, all types of device access, unexpected access surge, discrete user groups have put forward high technical requirements to live streaming platforms, it is not easy to ensure a smooth live streaming experience. Wangsu’s mobile streaming solution can provide an integrated solution covering cloud, pipeline and devices, massive redundant resources, professional technical service capabilities, and help live streaming platforms to enhance customer stickiness and boost user loyalty. With the advent of Internet +, the manufacturing industry has transformed from “made in China” to “made smart in China”, and the electrical appliance industry has ushered in a great change in the field of information. The solution is aimed at the internal and external IT application system, e-commerce platform, mobile APP, official WeChat account, smart home and Internet of things, as well as many other aspects of the home appliance manufacturing industry. By helping enterprises to carry out business cloud migration, improve global user access speed, platform application stability experience, business promotion efficiency and network security, reduce operating costs, Wangsu enabled the rapid transformation of traditional home appliance manufacturing industry. The rapid development of Internet and communication technologies has expanded the market demand of the consumer electronics industry. The shipments of electronic products represented by smartphones are increasing on a daily basis. At the same time, it also puts forward higher requirements on the enterprises’ ability to serve the market. Wangsu consumer electronics industry solution can effectively address the problems of slow access to websites, internal office system, unpleasant application download and user access experience, etc., and quickly distribute enterprise content all over the globe to enhance user experience, thus boosting brands’ service capabilities. Help enterprises reduce their operating cost. Websites and e-commerce sales platforms have become one of the important image display and sales channels in the FMCG industry. Network access speed and network security issues have become an important indicator to measure the consumer experience. In accordance with the characteristics of the FMCG industry, Wangsu’s FMCG industry network solution provides e-commerce, security, mobile application, global acceleration and various other services that can help customers to seize the first opportunities in competition. Support live streaming accelerator, VOD accelerator, uploading accelerator, mobile Internet accelerator, peer-to-peer cloud transmission accelerator and so on, and comprehensively guarantee fast and secure video transmission. In addition to traditional methods of monitoring, Wangsu can also monitor video streaming fluctuations, user playback fluency, playing errors and so on at the video streaming level, and improve user complaint handling efficiency. As the first landing point for network users, portal websites provide rich contents and diversified formats in the Internet era of video explosion, the rapid development of live streaming, on-demand streaming, interactive streaming, VR, etc. require increasing amounts of network transmission. At the same time, users demand on video clarity, smooth video playback and multi-device video recording and uploading is placing strict requirements on the enterprise’s technical strength. Combined with today’s complex network environment, multi-device playback, high bandwidth costs and source site access pressure, enterprises are becoming overwhelmed. Wangsu’s one-stop solution addresses the “three highs” of high cost, high technical barrier and high latency. Alternative energy vehicles, smart cars, Internet of Vehicles, autonomous driving have become the focus of the automotive industry, in addition to many domestic automotive companies planning to enter the international market and expand international business, car manufacturers are placing increasing reliance on networks. High-quality network transmission and a safe network environment is the technical guarantee for the development of automotive enterprises, and also an important factor related to the user experience. Wangsu automotive industry solutions provide a highly efficient and reliable network transmission environment for the future development of automotive enterprises and the notion of globalization. Wangsu – China Internet Security Report collects data from 1500+ Wangsu global accelarator nodes and 10 major security mitigation. There were 2,575,077,348 daily attacks observed and anti-DDoS attack at a peak of 1.02Tbp in 2018 under Wangsu cloud security platform surveillance. The report uses the data based on the platform and analyzes the period major cyber security incidents from DDoS attack, web protection, bot guard and etc. aspects in various industries as well as providing advices and solutions. 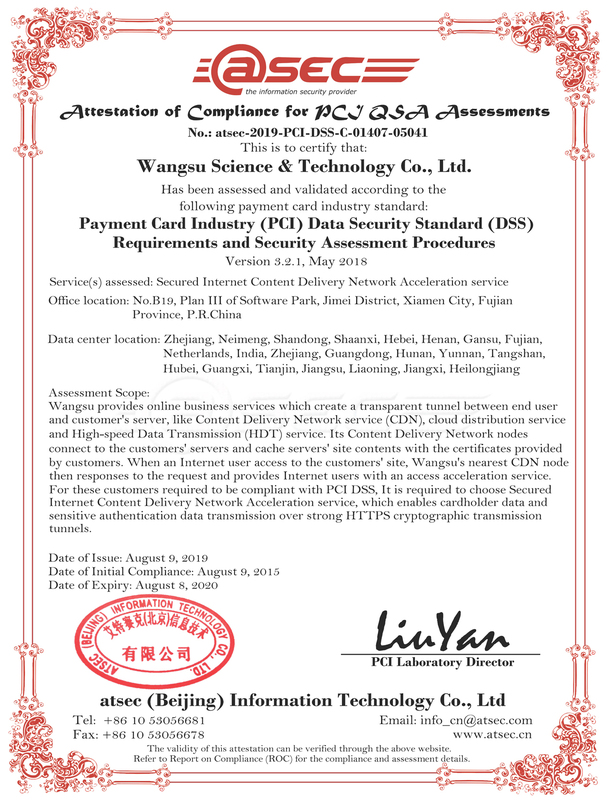 Since its founding, Wangsu has consistently complied with industrial, national and international compliance requirements and continuously integrated numerous compliance control points into its business platform and product designs. Meanwhile, Wangsu has played a leading role in standards formulation in CDN, cloud service in addition to other fields and contributed its advanced experience. Adhering to the concept of Compliance as a Service, Wangsu commits itself to building and operating globally leading Internet infrastructure service platforms.